Buddy’s International Hotel, which was sold to Turkish hotelier Sudi Özkan last month for US$25 million, could soon bear the Hilton brand if current talks come to fruition and will see massive investment for an upgrade to a five-star property. Confirming that the sale of the property for US$13 million more than was spent to construct it last year for Cricket World Cup was inked in late April, the new owner said he had immediately approached the Hilton and Sheraton hotels with the idea of the property carrying either brand. A team from Hilton is expected to visit the property within the next two weeks to conduct an assessment and indicate the list of requirements that should be fulfilled if the hotel were to carry the Hilton brand. Pending a decision on that score, and following the transfer process of the property to the Princess Group, which is expected to take place within the next three weeks, Özkan will begin heavy investments to upgrade the property to a five-star line. Asked about issues surrounding the land on which the property sits, which had been leased from the government, Özkan said he purchased the hotel on the “condition” that the land would be transferred him. Özkan said the sale price covered all expenses relating to the property including loans and the expansive land. Another key aspect of the deal with the Guyanese authorities is that a licence would be granted to establish and operate a casino at the property. An amendment to the Gambling Prevention Act in January 2007 facilitated the establishment of such a Gaming Authority but it has yet to be operationalised. Özkan said he had met President Bharrat Jagdeo briefly prior to purchasing the property to determine whether government would back the project. He said he was given all assurances that government was behind the multi-million-dollar investment. A management team of Turkish and Bulgarian professionals from the Princess Group and headed by Bulgarian Dontcho Dontchev is already in place to take charge of the operation. Dontchev had been working at one of the group’s hotels in Bulgaria. Özkan said while the hotel would tap into the local human resources market as much as possible, certain professionals would be brought in from abroad. He also noted that if the property were to carry the Hilton brand, it would have to maintain a certain standard and the skills of employees would be upgraded, where necessary. Asked how the Princess Group planned to attract tourists to Guyana given the crime situation here, Özkan’s wife Katsiaryna, who sat in on the interview, said many travellers and business persons look for quality service when visiting a destination and having a branded hotel would attract a certain level of clientele to the country. Özkan added that safety of guests would be a high priority and the security at the property would be high. He said too that Guyana was a “very nice place,” rich in natural resources, which was also something that more and more travellers look forward to. Katsiaryna Özkan, a Belarusian, said too that her husband did not invest solely “to make money,” but because he was also very community minded. Princess Port de Plaisance, the up-scale property which the company operates in St Maarten is reputed for its community-mindedness and donates frequently to local charities. Katsiaryna and the Princess Group have also teamed up with Help Our Children Foundation, a local non-profit foundation, over the last two years to organise the annual biggest children’s event and fundraiser in St Maarten – Childfest, which this year attracted some 4,000 children and adults. She said similar initiatives, that benefit children, can be expected in Guyana once the property was up and running. “He is constantly investing because it keeps him busy,” Katsiaryna said of her husband. “He has this drive and he likes what he’s doing. This is a huge investment and we are hoping that it will open doors for many jobs for the locals. I think it’s a good step for Guyana especially with the crime and poverty in the country. In the meantime, Özkan said he would also explore other investment opportunities in Guyana and was specifically interested in the areas of mining and petroleum. Özkan who has interests in two casinos in St Maarten, also has hotel properties under the Princess Group in Suriname, Belize, Panama, Turkey and Belarus. 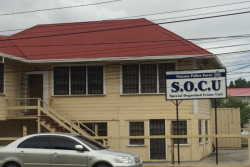 As was reported in the Sunday Stabroek, Buddy’s was constructed with funding that included five mortgages from the Guyana Bank of Trade and Industry (GBTI) and a $165.7 million advance on the sale of rooms to the Government of Guyana. The Ministry of Culture Youth and Sport has since paid over to the Ministry of Finance the sum of US$598,000 – approximately $119.6 million – of the $165.7 million that the government had advanced to the hotel. The remaining $46.1 million was said to have been recovered through room nights at the hotel.